1 x Central positive cling crimp - specifically designed for one-armed pull-ups. 2 x Small flat crimps / medium three finger open holds. 2 x Small open hand / sloping crimps. 1 x Hard central sloper (can be matched & half crimped). 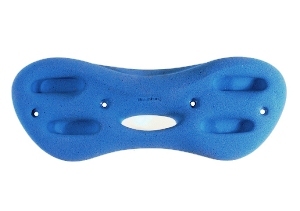 2 x Medium cling grips / large open hand. Narrow width to keep the climber away from the doorframe. Progressive hold sizing to challenge and vary deadhangs. Super smooth BleauStone texture to minimise skin wear whilst maintaining friction - sore skin is no longer a limiting factor.